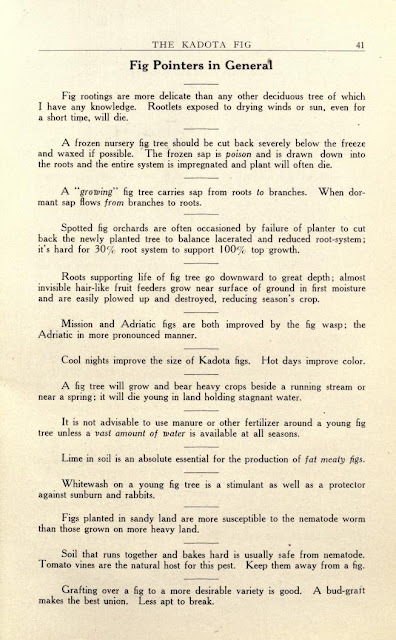 In my wildly-ranging and near-constant summer curiosity, I recently came across a book: The Kadota Fig: A Treatise on its Origin, Planting and Care, by W. Sam Clark of Sultana, California, published in 1920. This is a weird little text, written in such highly overwrought Victorian-ese, it is hard to read without laughing both in shock and frustration. In after centuries, was it not the dark-skinned Padres of Old Spain whose indomitable spirit and loving kindly ways blazed the Christian trails into our western lands, bringing comfort and spiritual cheer, and implanting with their blessings this same old fig in the sun-kissed lands of California? Does not this fig image an exact reproduction of these patient and blessed men who gave this fig and their lives to us? Does it not furnish physical shade and protection, temporal food and spiritual inspiration and lasting blessings? Are its fruits not sweet and pure, dark in color, yet never failing in time and season? Are these fruits not like the Padres of old, ever welcome in humblest home, to lordly mansion, bringing peace and consolation to us all? Are they not almost one? Now comes the Kadota, a product of our land and time. Almost with meteoric speed and splendor, from out our western skies comes this fair-faced visitor, like [a] gracious maiden through parted curtains, a vision of beauty and joy. But, despite Clark's strange racism and insistence in philosophizing, I feel some sympathy towards him. 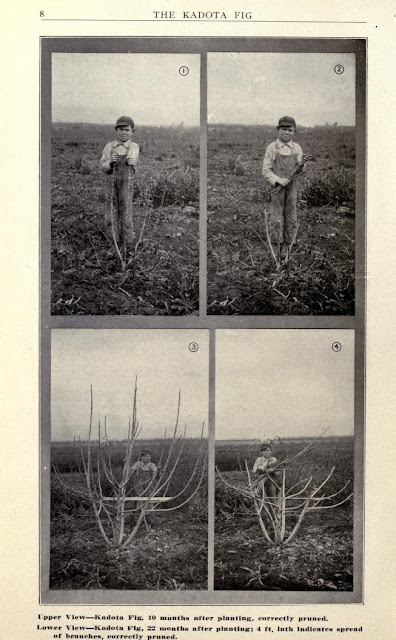 I too am constantly looking for the connection between people and plants; Clark seems to be some misguided (by the era's epidemic of racism) early ethnobotanist (before there was such a term) with a penchant for rhetorical questions. And though he didn't create the Kadota—it was a chance discovery by Stephen J. Taft , who discovered the fig growing near Fresno in someone else's field of Dottatos, the green Italian fig from the Calabria region—he certainly loved it. There is debate over whether or not Dottatos and Kadotas really are different figs, though according to Clark they certainly are, and in his mind, the Kadota is far superior. This fig, true product of our land and spirit of our people, brings us fame and honor, while radiating pure joy and pleasure. Vibrating from its very heart are the impulses of the Californian; scattering with the prodigality and western abandonment its harvest of luscious fruit and fulfilled promises. Such enthusiasm! But I'm guilty of that too, calling my Eva's Pride tree "a miracle" and Mid Pride peaches fruit "to eat thoughtfully." It is hard not to be overtly fan-ish about something that you grow that produces food that tastes very good. Clark also writes that in 1919, he had earned 9 cents per pound, or $180 per ton for fresh figs, regardless of size or variety. According to the Crop Values 2011 Summary, published by National Agricultural Statistics Service, an arm of the USDA, the average amount a farmer received for a ton of fresh figs was $549 in 2010. I don't know how to comment on that fact; but I do know that seeing those two figures together means something, I just haven't figured out what. He also gives very good pruning advice, made all the more fascinating by the child-laborer who is doing the pruning. This book fascinates me; I haven't been able to get it out of my head since I found it. I kind of like Mr. Clark despite his glaring flaws. This man is passionately attached to things that grow, and that is an attachment I deeply understand. Perhaps someone years from now will come across my scribblings and laugh or roll her eyes. Maybe she'll think that I was a victim of whatever cultural bias I can't see because I'm smack in the middle of it, and maybe she'll complain about my overuse of coordinating conjunctions. I hope, however, that somehow she gets some part of me, that we're able to connect across time through our love for that which grows, and if we can, right now that feels pretty good to me. Give this to your friends and ask them to guess what it is: very tropical with hints lime, bright with gin and a hit of resinous interest, but ending rich and almost creamy, as if a whole coconut were concentrated down into the liqueur. Dissolve the sugar in the water over medium heat. Add the fig leaves and bring the mixture to a full boil, keeping it there for 15-20 minutes. Remove from heat and let cool completely. Remove the leaves, pressing them against the side of the pan to release any fluid. Discard the spent leaves. Stir in the gin. Taste what you just made. Isn't it tasty? And it hasn't even aged yet. Pour the mixture through a fine strainer (there shouldn't be any residue, but just in case) and into a sterilized bottle to age. Cap the bottle and let the mixture age for a month or so somewhere cool and dark. Serve neat, or, as Grimes suggests, with pineapple juice. I would love to try making the fig liqueur, but I wandered out into the garden yesterday after you tweeted about it, and my fig trees are still too small - I would strip them of leaves :( I will have to wait! That little book certainly is a curiosity. I glanced through it quickly. Some of the photos are priceless. And that poem at the end... But you are so right about it being an expression of the author's passion for that fig. I suppose I'm equally guilty about my passion for growing edibles, why else would I be blogging about them, droning on and on about what I'm growing and harvesting. Thanks for the recipe for the fig liqueur, now I'll be able to get something from my little tree that has lots of leaves but no fruit. Overwrought Victorian-ese sounds like a term belonging to our times. It also reminds me one's first reading of the Book of Alcoholics Anonymous. A tome whose language, by consensus, has never changed. " John Barleycorn" too funny. Now the Mission fig is called a Dottatos? or is that the green fig Italians favor? My partner would like to plant a fig tree. I might consider it if it's capable of growing on my slope without a retaining wall, and it doesn't block my view. Emma: Ack! Will you be starting school this fall (if I remember correctly) for the ethnobotany program? If so, there might be some on campus you could snag. Michelle: Oh, the poem. I almost included it in this post but it is just sooooooooooooooo bad. Do try the fig liqueur and let me know what you think. PA: Ha! On another note, did you ever read Jack London's "John Barleycorn"? It's a great read. No, the Mission figs are Mission figs. Dottatos are Kadotas, the Italian green figs with the amber, not pink, centers. I have to figs that I keep small. The Kadota wants to grow bigger, but I keep pruning it to almost an espalier against the fence. It's quite easy, really. Figs don't require much work compared to other fruit trees. I also have a Black Jack, a dark-fruited fig with really large fruits, but a naturally dwarfed growing habit. It's tasty too, more similar to a Mission, but not quite as dark. You might consider that because it will be even easier to keep smaller--less pruning required. Mmmmm, figs. I've got the humble Mission Fig. Is this a quote from Wuthering Heights? "Starve it, abuse it, pretend it isn't there, and still it will refuse to die [or something, something]." That's my tree. AH: Why do I use Hendricks? Because it tastes so good. And, I knew that part of the flavor of this stuff is gin, so I wanted a gin I really like. But, I think it will be tasty with something else too. I guess I should write, use a gin you like, because you can taste it; the flavor isn't hidden behind the other flavors. I can't picture where the Mission fig tree is in your yard. I like Mission figs--does Albert eat them off the tree/ground? Indiana keeps looking longingly at the fruit on the trees, but I haven't seen any evidence of him actually eating one (yet). I made the fig liqueur and it is yummy! I can't wait for it to age a bit more.